Physical characteristics: Ruddy turnstones range in length from 8.3 to 10.2 inches (21 to 26 centimeters) and from 3 to 6.7 ounces (84 to 190 grams) in weight. The head, neck, throat, and chest have bold black and white markings. The back is chestnut and black, while the belly is pale. Females and males differ somewhat in coloration. Geographic range: Ruddy turnstones breed in high northern latitudes worldwide, and winter further south. Either breeding or wintering populations are found on all continents except Antarctica. Habitat: Ruddy turnstones breed in tundra habitats as well as wetlands such as marshes and stony coastal plains. They spend the winter on rocky, stony, or sandy beaches. Diet: Ruddy turnstones flip over stones to look for food. Their diet consists largely of insects, crustaceans, mollusks, worms, fish, carrion, and bird eggs. 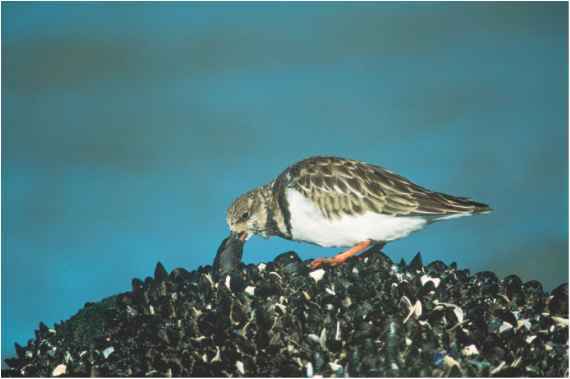 Behavior and reproduction: Ruddy turnstones are often found in flocks during the nonbreeding season. During the breeding season, they are found in isolated pairs. The female lays two to four eggs at a time, usually in open nests or in nests hidden in vegetation. Eggs hatch after twenty-two to twenty-four days. Ruddy turnstones and people: No significant interactions between ruddy turnstones and people are known. "Sandpipers, Curlews, Woodcocks, Phalaropes, etc." Bird Families of the World, Cornell University. http://www.eeb.cornell.edu/winkler/botw/ scolopacidae.html (accessed on June 3, 2004). "Scolopacidae (Snipes and Sandpipers)." The Internet Bird Collection. http://www.hbw.com/ibc/phtml/familia.phtml?idFamilia=61 (accessed on June 1, 2004).